A regionally accredited distance masters in computer science and information services can cost as little as $5,436 (Columbus State University of Georgia) or as much as $64,800 (Carnegie Mellon University - Pennsylvania) according to GetEducated.com's just published online education survey of 67 regionally accredited universities which offer online graduate degrees. Average cost of an online masters degree in the computer science career area: $23,620. The top three most expensive online university options for a masters in a computer area: Stanford University, Carnegie Mellon University, and New York University: all three private, name-brand brick and mortar colleges with price tags between $57,000-$65,000. Vicky Phillips, GetEducated's founder, points to the least expensive online masters in the rankings this year, Columbus State University, as an example of the amazing deals available to online students if they take the time to compare online college degree options. Columbus State, a traditional brick and mortar publicly funded college, offers the same degrees they offer on campus in distance and online learning format for a modest cost of $5,436 for either an online Master of Science in Applied Computer Science - Information Assurance or a distance Master of Science in Applied Computer Science - Software Development. "At a cost of more than $18,000 less than the national average, Columbus State University in Georgia is a remarkable bargain buy for learners nationwide," comments Phillips. GetEducated.com's national survey of online computer science graduate schools, released this week, is the only survey of its kind. The national online education survey included 67 regionally accredited graduate schools and identified several trends in online degree pricing that impact consumers as they go online to earn masters or doctorate degrees in computers and information systems. "Consumers should be warned that there is no relationship between cost and quality in online education," states Phillips, Chief Education Analyst. In fact, the computer science and information systems survey revealed that the prime factor affecting cost is whether the college operates as private or public or as a non-profit versus a for-profit institution. "For-profit colleges cost up to three times more than their publicly funded counterparts," reveals Phillips. "These schools cost more because they spend so much more money on marketing and because they rely on the tuition paid directly to them by consumers to turn a profit." Not surprisingly, the online education expert recommends that cost conscious consumers explore publicly funded and state university systems, over 70% of which now offer graduate degrees online. "GetEducated's top 13 ranked Best Buys in online computer science and information systems degrees come from publicly funded universities," reveals Phillips. "Many publicly funded universities are beginning to offer degree programs online for one flat fee. This means prospective students nationwide can now enjoy low public college tuition rates that were once available only to residents of selected states." Phillips points to online degrees offered by Jacksonville State University (ranked 2nd) at under $7,000 for Alabama residents ($13,500 for others); Indiana State University (ranked 4th) at $7,438 for all learners nationwide; Dakota State University (ranked 6th) at $8,081; as well as Colorado State University (ranked 23rd) at $16,341, as bargain buys for adult students online. 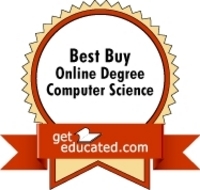 A large number of name-brand public colleges rated high on GetEducated's Top Ranked Best Buys Computer Science list, including Dakota State University, North Carolina State, The University of Illinois Springfield, The University of Maryland, The State University of New York (SUNY), the University of California Chico, and Colorado State University. This free consumer-oriented ebook profiles more than 300 screened, accredited online degrees (USA) in computer science, management of information technology and allied career areas. About: Founded in 1989, GetEducated.com, LLC is the safest place in cyberspace to shop for your online degree ™. In a nationwide campaign to assist consumers in locating quality online education schools the firm rates and ranks online colleges and universities and actively campaigns against online diploma and degree mills. In addition to rating and ranking online schools the clearinghouse operates the Diploma Mill Police, a free online degree accreditation verification service designed to protect online degree seekers from fraud.